Year after year, we have increasing numbers of patients that come to us. We are also asked where we are and how to get to us. 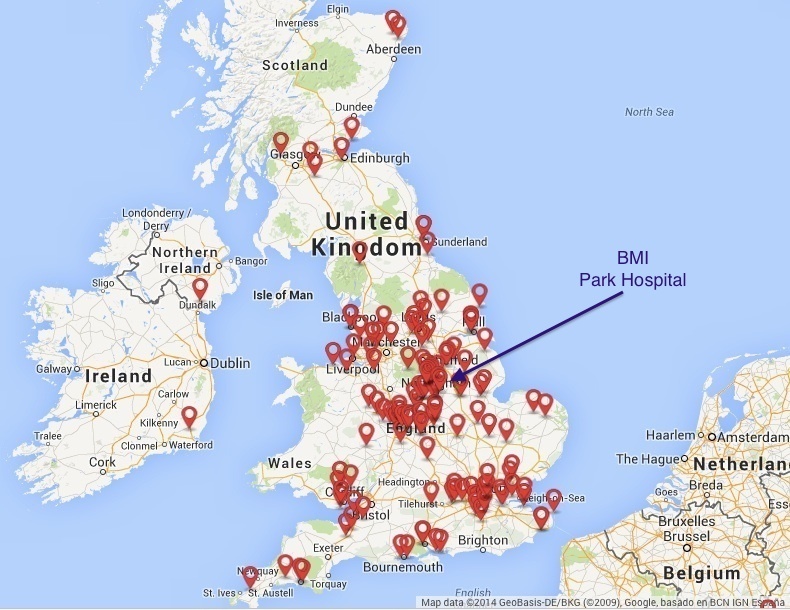 We are located at the BMI Park Hospital in Arnold, Nottingham. Our postcode is NG5 8RX should you wish to work out the distance and travelling time. We have compiled a map of patients from the last 18 months, to give you an idea of where people have come from to get to us, and the distances that people are prepared to travel to have their sterilization reversed with Mr Pickles. If you are planning to come to us for surgery, we can advise you of local accommodation where you might want stay immediately before your surgery or once you are discharged. If you ring Mandy on 0115 906 3079, she will be able to assist you.